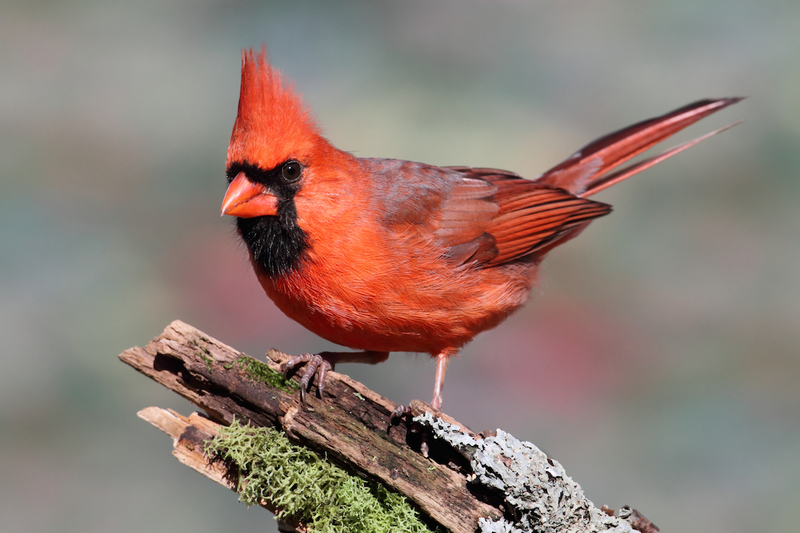 Male cardinals have bright red feathers. 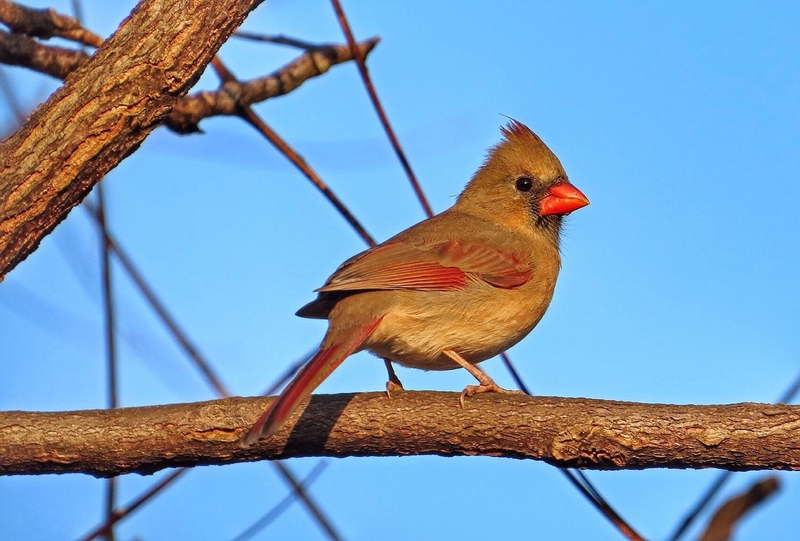 Female cardinals have the same crest on their heads as the red- feathered males. 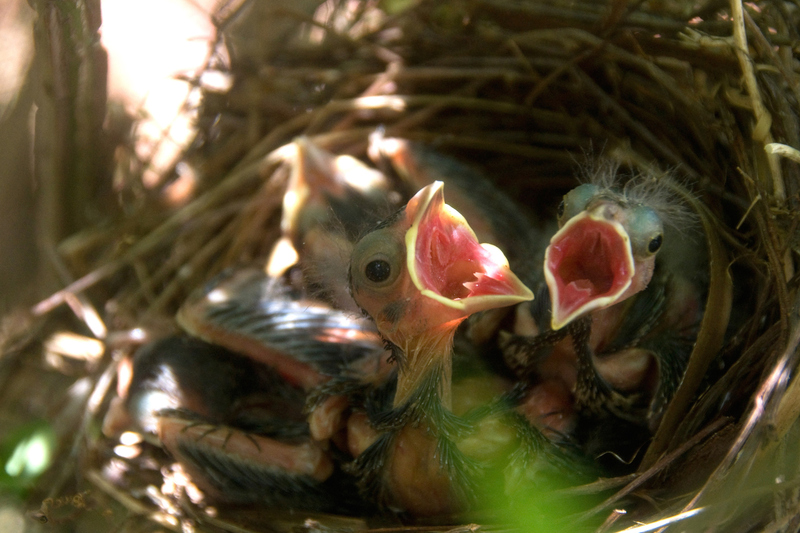 These one-week-old baby cardinals are hungry. They wait for food with their mouths open. What does a cardinal look like? The northern cardinal has a wingspan of 10 to 12 inches (25 to 30 cm). The male is easy to spot because he is bright red and has a black face. The female cardinal has light brown feathers. They both have short beaks and pointy crests atop their heads. Northern cardinals are mostly found in the eastern, central, and southern United States. You can find cardinals in your backyard or at your local park. Cardinals also live on the edge of forests. They like to build nests in shrubs and trees. Cardinals are not picky eaters. They eat seeds, insects, flowers, berries, and grass. They can be spotted eating sunflower seeds out of backyard bird feeders, too! The Northern cardinal is the state bird of Illinois, Indiana, Kentucky, North Carolina, Ohio, Virginia, and West Virginia. "Cardinals." Report Builder, Gareth Stevens Publishing, garethreportbuilder.com/article/243/cardinals. Accessed 24 Apr, 2019.